For anyone who cares for the prospect ratings, one of the most respected analysts is ESPN’s Keith Law. Also, for anyone who cares about the Detroit Tigers, the only prospect who appears on his top 50 list is outfielder Nick Castellanos. Castellanos has moved up to number 22 on the list, but some feel his value has actually gone down since moving to the outfield. After seeing him play in West Michigan in 2011, his defense at third wasn’t really his strongest tool. He wasn’t horrible, mind you, but a move to the outfield in an organization that sports Miguel Cabrera at the hot corner, can only be a positive move for him. Castellanos started the season ranked at 38, but is having a solid season in his first year at Triple-A with the Toledo, batting .281 with 12 home runs and 49 RBI’s. In June, he pounded out a .361 average with five home runs, but has slumped a tad in July. He has gone 3-6 after the Triple-A All-Star Game, however, a game he missed due to the birth of his first child. Nick is not exclusive to right field, though, and has played in left for Toledo and Erie last year. If the Tigers do decide to move Castellanos, it should be for a player that will not only improve their chances at a World Series this season, but for years to come. He’s still only 21-year-old, so plenty of time for him to develop and not rush his Major League debut, which some feel will come this September. 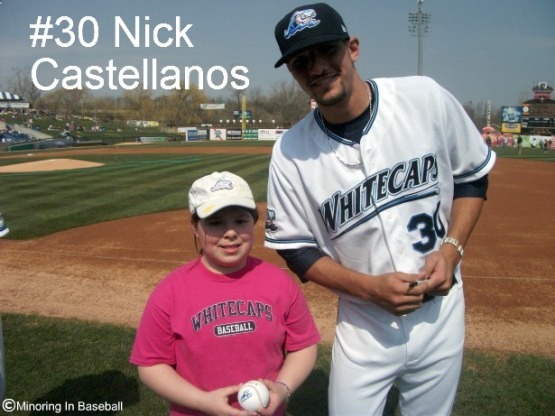 For the Whitecaps in 2011, Castellanos hit .312 with 36 doubles, seven home runs, and 76 RBI’s. He is currently ranked 15th on the prospect list released by Baseball America, also. He’s put up solid numbers. Cool that I’ll know who he is when he does get his call up. Thanks! Thanks, Shannon! If he ever makes it big, Lily will have a nice memory of meeting him, too. Yeah, at 21 they shouldn’t rush him, but I’ve never been a fan of waiting too long. Look at the Cubs that wait forever to bring the kids up. Some kids are ready at different ages and levels. If he’s still learning a new position, give him time to master that before bringing him up. I don’t like to see these kids brought up just to sit the bench, either.